A talented sailor studying at The Sixth Form College, Solihull has just won a Gold Medal at the National Sailing competition. 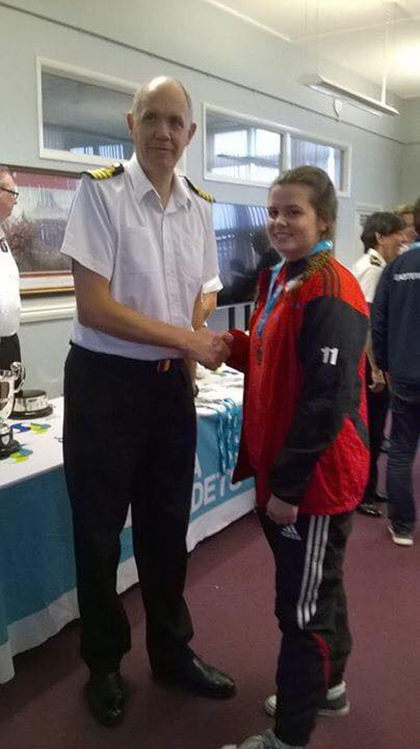 Abigail Seaton (aged 16, from Solihull) took part in the Portsmouth Yardstick class of the National Sailing competition at Southport. She sailed her own Laser Radial boat in three races, achieving first place in both the first and second races and third place in the last race. She was up against approximately 20 others sailing in the same class, as well as four other classes racing at the same time, with people from all over the UK from Northern Ireland to London. All those sailing has earned their place by achieving either first or second place in their Area Sailing competition; Abigail won her class, as well as the District competition. “I was really pleased with my performance and I enjoyed the competition a great deal. I have been doing Sea Cadets at the Shirley Unit for almost two years. I found out about it at my sailing club, Olton Mere, when a few of the staff were doing their Dingy Instructors course with the club. I joined and started doing the Duke of Edinburgh award, for which I have completed the bronze award and I am currently doing the silver award. I have done advanced sailing modules through Sea Cadets and I am hoping to be able to do my Dingy Instructors course with the Sea Cadets soon. The former Langley School student is currently studying on the BTEC Extended Diploma in Art & Design course at the College. The Sea Cadets has just under 400 units around the UK, with around 14,000 cadets and cadets compete in local District competitions. There is also a larger regional area competition, before progression to Nationals to represent the South West Area Sea Cadets, which is made up of around 76 units spread from mid Wales, over to the Midlands and down to the South coast of England to include Devon and Cornwall and everything in between.